In celebrating 1500 years since the time of St Benedict on 11th July 1980, we realised one of our dreams with the consecration and opening of the Monastery Chapel by His Eminence Sir James Cardinal Freeman. “The Chapel was part of design brief that included the completion of the symmetrical approach façade to the original Monastery buildings a new Library for the Monastery’s extensive book collection. The Library was designed to form a traditional cloistered courtyard with the existing buildings and has a matching colonnade leading to the Chapel. 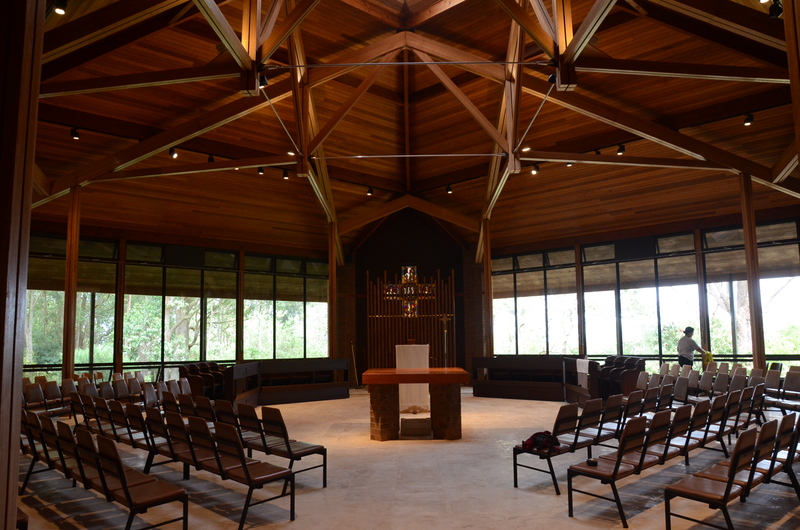 The Chapel is sited at the junction of tree and field, forest and mountain, intimacy and infinity. The entrance axis towards the cross window splits these aspects, heightening awareness of each as well as the cross window. The plan form of the Chapel is cruciform with a central altar. This evolved from both the axis and approach geometry as well as the desires for a spacious yet intimate atmosphere. The leadlight windows are framed within simply shaped, fairly dark gabled apses that allow them to be viewed in isolation as well as within the context of the building. The central columns of surrounding the altar are a deliberate attempt at avoiding structural virtuosity and to keep the roof ‘earth connected’, whilst at the same time they serve to lead the eye to the glass pyramid at the apex. In preparation for our 50th anniversary celebrations in 2011 we replaced the original gold carpet with travertine, replaced the four central columns with eight thinner columns closer to the walls, which now define an ambulatory around the edge of the chapel, installed a screen built of recycled timbers from the original columns, defining a blessed sacrament chapel behind the presider’s chair and reduced the size of the altar. 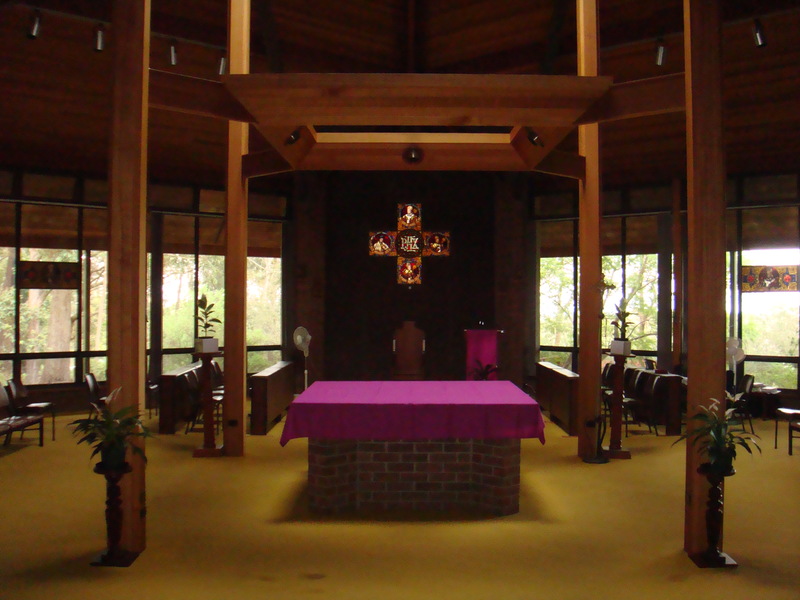 The presider’s chair, the monks’ choir and the public seating are now arranged in a hexagonal form around the altar. We also replaced the windows with double glazing and improved the climate within the space.